This is a guide to finding records of merchant seamen in service before the start of the First World War. Before 1835, central government took little interest in keeping records of individual seafarers, so most of the records covered in this guide date from between 1835 and 1913. For details of seamen in employment before 1835 your best bet is to consult muster rolls or to look elsewhere, perhaps in private collections or old newspapers. If you are looking for a record of a merchant officer, read our guide on Officers in the Merchant Navy. Between 1858 and the First World War the Merchant Navy did not keep registers of its seamen. This means that for these years the only record you are likely to find of an individual merchant seaman is his appearance in agreements and crew lists, for which you usually need to know the names of the ships he served on. See our guide to Abbreviations in merchant seamen records for further help interpreting information in these records. 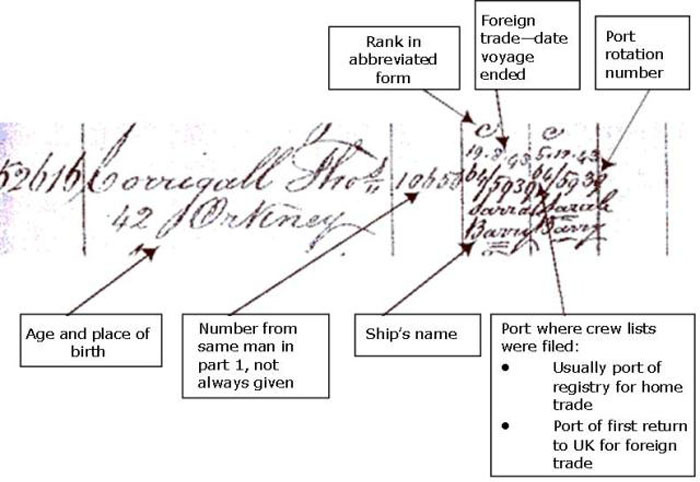 From 1835, the new Register Office of Merchant Seamen (later the Registrar General of Shipping and Seamen) recorded details of seamen in registers. The information came from the agreements and crew lists submitted by the masters of ships at the end of one or a series of voyages. Register of Seamen Series I, 1835-1836 – the originals are in series BT 120. 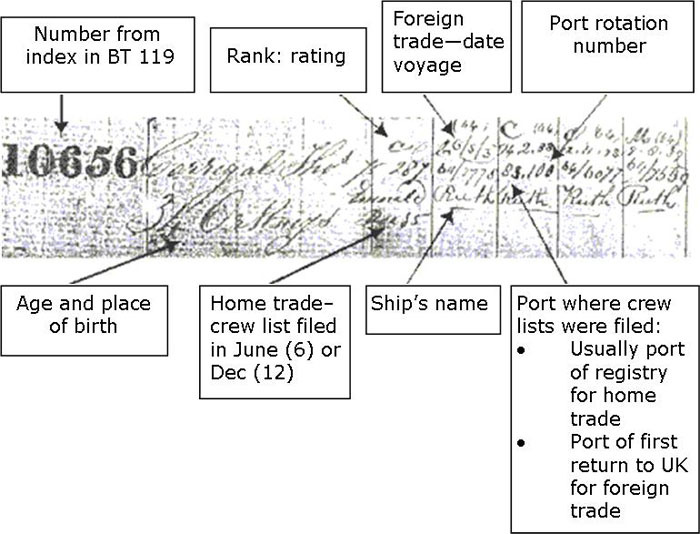 Register of Seamen Series II, 1835-1844 – the originals are in series BT 112 (a name index to which is in BT 119). See Appendix 2 for an example of a typical register entry from 1835-1840 and Appendix 3 for an example from 1842-1844. 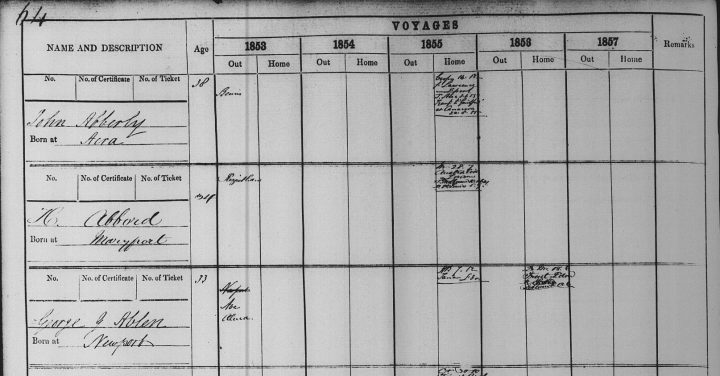 Register of Seamen’s Tickets, 1845-1854 – the originals are in series BT 113 (a surname index to which is in BT 114 – though any ticket numbers above 546,00 in the indexes do not appear in the registers). See Appendix 4 for an example of a typical register entry from 1845-1854. Register of Seamen Series III, 1853-1857 – the originals are in series BT 116. See Appendix 5 for an example of a typical register entry from 1853-1857. Search by name the indexes of apprentices registered in the Merchant Navy between 1824 and 1910 (BT 150/1-53) on Ancestry (£). These index the original indentures in BT 151 and BT 152. Please note only a sample of these original indentures survive – for further information see below. Search the register of duties paid for apprenctices’ indentures on Ancestry (£). These records of apprenticeships, from IR 1, are for various professions, including seamen both as apprentices and as masters. From 1747 masters or owners of merchant ships were required to keep a muster roll giving details of the number of crewmen and the ship’s voyages. We provide more advice on finding muster rolls in our guide to these records. In 1835, following the Merchant Shipping Act, muster books were replaced by similar records known as ‘agreements and crew lists’. You can search for agreements and crew lists by ships’ port of registry (1835-1844), alphabetical ranges of ships’ names (1845-1856) or numerical ranges of ships’ numbers (1857-1860) in BT 98. There is more advice on finding agreements and crew lists in our more in-depth guide to these records. The National Archives holds a 10% sample of agreements and crew lists for 1861 to 1938, held in record series BT 99. Search the agreements and crew lists in BT 99 by the ship’s official number for the period 1861 to 1938. There is more advice on finding agreements and crew lists, 1861-1938 in our more in-depth guide to these records. Browse the indexes of apprentices registered in the merchant navy in BT 150. Please note the indexes for 1824-1910 are available online (see above). These are indexes to the apprentices’ indentures in BT 151 and BT 152. Browse BT 151 and BT 152 by date and by port. Please note only a sample survive (a two month sample for every five years). Maritime History Archive in Newfoundland holds approximately 70% of the crew lists and agreements for the years 1861-1938 and 1951-1976. You can search these by ship’s official number. National Maritime Museum in London holds 10% of agreements and crew lists for the periods 1861-1938 and 1951-1976. In general, the records held are for years ending with five (1865, 1875, and so on) however they do hold some other years too. Contact them directly to find out more. Search the Apprentices of Great Britain 1710-1774 database on Findmypast.co.uk (£) for indexes to apprenticeships in IR 1. Consult the Crew List Index Project (CLIP) website, which has information about merchant seamen on British registered ships from 1861 to 1913. Details of the voyages a seaman took are recorded in most of the registers. Some are ‘home trade’ voyages (ships sailing in waters around Britain) and others are ‘foreign trade’ voyages (ships sailing further afield). 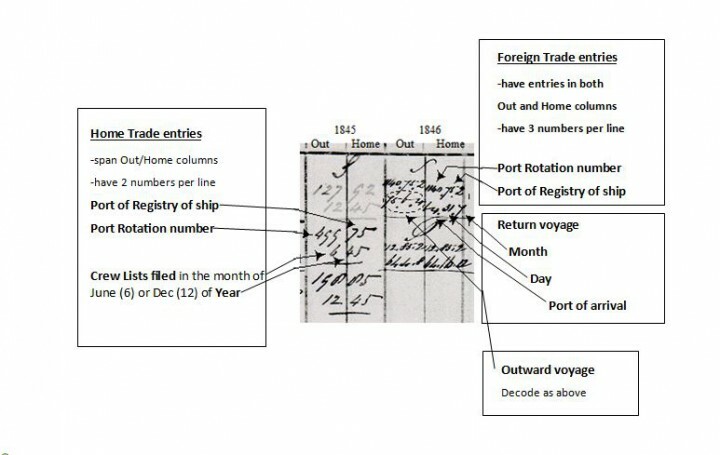 Where home trade voyages are recorded in the registers, entries do not simply record a single voyage, but a half year (January to June or July to December) during which the seaman was engaged on a particular ship. During that period the ship may have been on several voyages. The seaman may have been engaged for some or all of the period. Foreign trade voyage entries record a single voyage during which the seaman was engaged on a particular ship. There may be dates for both leaving the UK (expressed as ‘out’) and for returning to the UK (expressed as ‘home’). A seaman may have left the UK on one ship and returned on another. Equally, the ship may have departed in one year and returned in the next. The registers are of two types. The entries in the earlier registers, part 1 1835-1840 (first image) look slightly different in layout to those from the later period 1842-1844 (second image). There do not seem to be any ‘reported voyages’ for the years 1849, 1850 and 1854. Register of Seamen’s Tickets, BT 113. Register of Seamen, Series III, BT 116. Document reference: BT 116/1.